This is the second piece that we’ve received from Love 41 (we reviewed their Men’s Fork Tine Bracelet earlier). The Love 41 Weekender Bag arrived just in time for me to be able to use it on an extended weekend trip over the Fourth of July holiday. My initial reaction to seeing the size of the bag and the layout of the pockets was extremely favorable – lots of space, and pockets just where you want and need them. Needless to say, I was anxious to use it. To give a brief refresher, Love 41 is the “daughter” company of Saddleback Leather. Suzette Munson designs many of the bags found on Love 41 and operates the company as an online retailer that devotes 100% of its profits to supporting work being done in Rwanda for orphans and widows there. We encourage you to take a few minutes out of your hectic schedule to read about Love 41 and what’s happening in Rwanda due in part to their dedication and your purchases through the company. If you’ve had the privilege of using and carrying a Saddleback piece of any kind, you’ll notice some similarities in construction here. The Love 41 Weekender Bag is built to last. Suzette designed this piece to handle years and years of use. The bag has a generous helping of thick, full grain leather and incorporates waterproof, heavy waxed cotton from Scotland into it as well. Cap it off with heavy-duty antique brass hardware (zippers, clasps, snaps, D-rings) and you have a superbly crafted bag. It’s also backed with a 41 year warranty, which further reinforces the fact that this piece is well-engineered and created with expert craftsmanship. Personally, I think the dimensions of this bag are right on the mark (22 1/2″W x 15 3/4″H x 10 1/2″D). I did not struggle at all to fit into it everything I needed to carry with me for the extended weekend. In fact, I had room to spare – which is an accomplishment for me. At 6’5” tall, my clothes are large. When I can throw a pair of size 12 shoes and the rest of my gear into one carry-on bag for a 3 ½ day weekend jaunt, I consider that to be awesome. The small zippered pocket inside creates a safe, easy to access area for storing watches and other small personal items that you don’t want just floating around in the main compartment. The large front side pocket is ideal for carrying the now standard TSA-friendly see-through bag for your liquids and toiletry items. With the antique brass quick closure clasp on the pocket, you can easily remove it for screening and quickly put it back in after successfully navigating your way through security. Of course that pocket can be used for a myriad of other things – that was just how I chose to use it. The slot pocket on the rear is ideal for a magazine or newspaper. And never once have I had an issue with it fitting into any of the overhead bins on the various planes flown on to date. The dual shoulder pads on the straps are very nice and comfortable – especially when you’re traveling by air and you have to change planes between two very spread out gates. Those thick pads allow you to carry the bag for long distances without it cutting into your shoulder. The great folks at Love 41 sent this bag to me because it has, for a lack of better terminology, “cross-gender appeal”. Since my trip to Florida, my wife has also used this bag on two separate occasions for short trips – once down to Sun Valley, Idaho for a weekend and once over to Seattle, WA for a family wedding. We both find the color and combination of leather and canvas to be very appealing. The detachable pockets on each end are ingenious. The large single pocket has become an everyday carry purse for my wife. The included strap and its size makes for an ideal cross body purse in her opinion. I think it looks great when she’s wearing it. The only very, very minor issue she’s encountered during her use of the bag is that when the bag is packed tightly, the end pockets have a tendency to come unsnapped from the end walls. Of course, my retort to that is…don’t pack so much stuff. However, that’s a battle I will never win. Like I said though, it’s an extremely minor issue and one certainly isn’t in danger of losing those end pockets, since they are also clipped onto the bag with d-rings and sturdy clasps in addition to the snaps. Now, consider yourself forewarned here. If you don’t like questions and comments from complete strangers about what you’re carrying, then I suggest you stick to the same old nylon stuff that most people carry when traveling. This bag has elicited comments on every single trip to date. Hotel clerks, folks at rental car counters, flight attendants, random passersby – all have expressed comments and asked questions about the Love 41 Weekender Bag. Be prepared. The Love 41 Weekender Bag is a great piece to own. At $572, its purchase price may sting a little at first. However, you’re definitely investing in a not only a superb quality piece of luggage that you will enjoy for years, but also investing in the betterment of Rwandans like John, Joyeause, Athanase, and others who will benefit from Love 41’s involvement there (read their stories here). At BestLeather.org, we think that’s a very wise choice and a great investment. 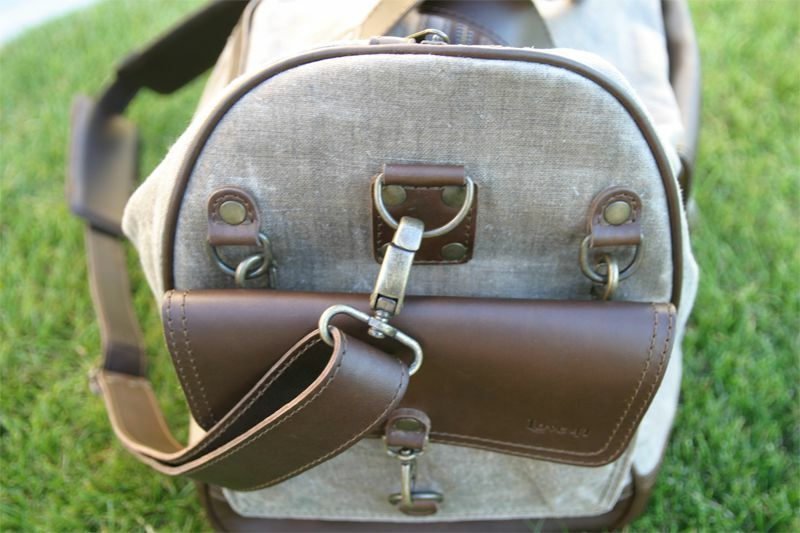 4 Comments on "Love 41 Weekender Bag Review – $578"